The Genova Bio is a simple, low cost, easy to use UV/visible spectrophotometer; dedicated for life science applications. The fast, responsive colour touchscreen and pre-programmed methods for the measurement of nucleic acid concentration and purity, protein assays and cell density, makes this spectrophotometer the ideal addition to any laboratory. 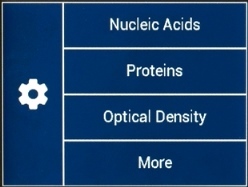 The Genova Bio utilises diode array technology to scan the entire wavelength range (198 to 800nm) in less than 3 seconds and the narrow spectral bandwidth of 3nm, makes it ideal to identify peaks for determining nucleic acid purity. The 1024 element diode array detector coupled with a flash xenon lamp results in a long life, robust spectrophotometer. Covered by a two-year warranty which includes the xenon lamp. 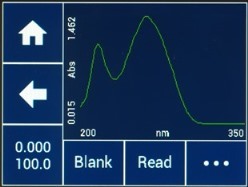 The Nucleic Acids measurement mode can be used to quantify the concentration and purity of dsDNA, ssDNA, RNA and oligonucleotides; using wavelengths recorded at 260, 280 and 230nm, with an optional correction at 320nm. The concentration is calculated along with the corresponding ratios. 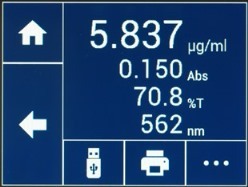 At the touch of a button it is easy to check the purity of the nucleic acids. This is done by identifying distorted peaks in the purity scan between 200 and 350nm. This is especially useful for RNA samples where impurities maybe present at 230nm, but cannot be detected using the 260/ 280nm ratio measurement. The Proteins measurement mode can be used to calculate protein concentration by creating standard curves from protein assay kits. With pre-programmed methods for measuring Bradford, Lowry, Biuret and Bicinchoninic Acid (BCA) assays; up to 6 standards can be measured with 3 replicates of each standard to minimise any dilution errors. 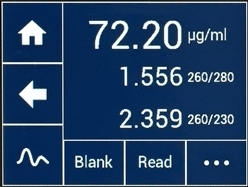 The Proteins measurement mode is also pre-programmed with the Direct UV and Warburg-Christian methods to determine protein purity. The Genova Bio has a pre-programmed method for measuring optical density of bacterial cultures such as E.Coli and yeast cells. This is ideal to measure cell growth before cell harvesting. 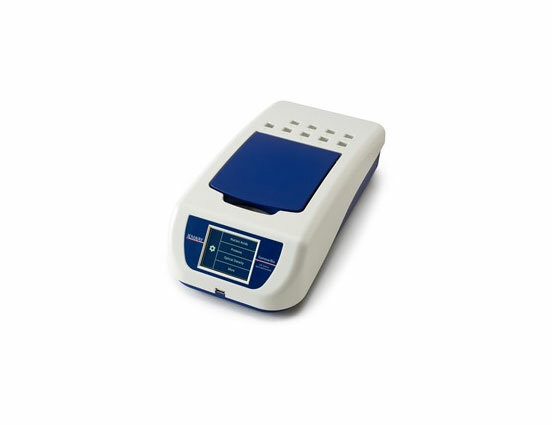 As well as these pre-programmed methods this versatile spectrophotometer has measurement modes for simple photometrics, concentration, quantitation, spectrum scanning and kinetics. Enabling measurements to be performed at any selected wavelength between 198 to 800nm.